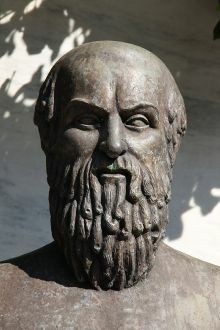 Aeschylus (525 B.C.E. – 456 B.C.E. ; Greek: Αἰσχύλος) was a playwright of ancient Greece, and the earliest of the three greatest Greek tragedians. Like Sophocles and Euripides, who would follow him, Aeschylus is one of the seminal figures in the development of drama in the Western world. If Sophocles was the dramatist whose primary theme was fate, Aeschylus was dramatist who examined the relation of the gods to the lives of mortal men. More than the other tragedians, Aeschylus was concerned about the role of the divine, the path to moral rectitude, and the nature of justice. His most famous cycles of plays, the Oresteia, uses the retelling of the myth of the House of Atreus in the aftermath of the Trojan War to explain the transition from the ancient law of revenge, the lex talionis, to the new system of trial by jury. This is seen as mythically representing one of the important turning points in the development of civilization. Aeschylus's concerns were no doubt influenced by his own turbulent and morally confusing times—the Athenian republic had just begun its experiment in democracy, and was constantly in danger of being usurped by local tyrants and foreign invaders. Aeschylus not only fought for Athenian democracy as a writer, but also as a soldier—he was wounded protecting Greece at the Battle of Marathon—and would later consider his achievements as a soldier, rather than a playwright, to be his greatest contribution to history. As a playwright, Aeschylus made important contributions to the dramatic art form. He was the first playwright of ancient Greece to include scenes containing multiple actors. Prior to his work, all Greek plays consisted of a single actor and a chorus that served as a sort of narrator. This development presaged the shift towards character and individual actors that would become the hallmark of modern theater. His plays are striking because they so closely resemble the modern conception of drama. The "Father of Tragedy," as he has been called, Aeschylus is also the father of character-driven drama as a whole. Aeschylus provides an important example of how closely art participates in human development. In the case of Aeschylus his plays engage the full range of human transformation from the nature divine human relations, through political, juridical, and social transformation. This foreshadows the enormous responsibility of artists, as their work not only reflects but influences human directions for better or for ill.
Born in 525 B.C.E. at Eleusis in western Attica, Aeschylus wrote his first plays in 498 B.C.E., but his earliest surviving play is probably The Persians, performed in 472 B.C.E. In 490 B.C.E., he participated in the Battle of Marathon, and in 480 B.C.E. he fought at the Battle of Salamis. Salamis was the subject of The Persians, written eight years later; it is now generally accepted that The Suppliants, once thought to be Aeschylus's earliest surviving tragedy (and therefore the earliest complete Attic tragedy to survive) was written in the last decade of his life, making The Persians his earliest. Aeschylus frequently traveled to Sicily, where the tyrant of Gela was a patron. In 458 B.C.E. he traveled there for the last time. According to legend, Aeschylus was killed in 456 B.C.E. when an eagle (or more likely a Lammergeier), mistaking the playwright's bald crown for a stone, dropped a tortoise on his head (though some accounts differ, claiming it was a stone dropped by an eagle or vulture that likely mistook his bald head for the egg of a flightless bird). Aeschylus' work has a strong moral and religious emphasis, concentrating on the human position in the cosmos in relation to the gods, divine law, and divine punishment—especially in the Oresteia trilogy. In addition to the literary merit of his work, Aeschylus' greatest contribution to the theater was the addition of a second actor to his scenes. Previously, the action took place between a single actor and the Greek chorus. This invention—the creation of a dialogue partner—was attributed to him by Aristotle. The existing canon of Aeschylus' plays includes a seventh, Prometheus Bound. Attributed to Aeschylus in antiquity, it is generally considered by modern scholars to be the work of an unknown playwright. One theory is that it was written by Euphorion, one of Aeschylus' sons, and produced as his father's work. Its language is much simpler than that which Aeschylus generally used, without the complexity of metaphor and imagery. It is closer to Sophocles' style (though it is not suggested that Sophocles is its author); its hostility to the figure of Zeus is completely at odds with the religious views of the other six plays. Most scholars of Greek literature currently agree that the attribution of the play to Aeschylus is tenuous at best. The Oresteia is a trilogy of plays whose action centers on the curse of the House of Atreus, a cycle of stories closely linked to the Trojan epic tradition of Homer. The trilogy is the only extant trilogy of the ancient Greek tragedies remaining, perhaps reflecting it popularity due to its profound story arc and powerful drama. The Oresteia is one of the most important texts of all Greek literature due to its subject matter; the development of Greek society beyond its primitive origins rooted in tribalism and family vengeance into a society based on justice and democracy. The trilogy is easily Aeschylus' crowning achievement, and is often ranked as the finest of all the ancient Greek tragedies ever composed. Agamemnon details the return of Agamemnon, King of Argos, from the Trojan War and his subsequent murder. Agamemnon, in his pursuit of Paris and Helen, was forced to sacrifice his own daughter, Iphigenia, for favorable sailing winds. His wife, Clytemnestra, in the ten years of Agamemnon's absence, plans her revenge. She enters into an adulterous relationship with Aegisthus, Agamemnon's cousin and the scion of a dispossessed branch of the family, who is determined to regain the throne he believes should rightfully belong to him. The play opens with Clytemnestra awaiting the return of her husband, having received the signal from the mountaintop beacons that Troy had fallen. Though she pretends to love her husband, she is furious that he sacrificed their daughter, Iphigenia. While the text does not make this clear, the audience would have already been aware of this. A servant stands on top of the roof, reporting that he has been crouching there "like a dog" (kunothen) for years, "under the instruction of a man-hearted woman." He laments the fortunes of the house, but promises to keep silent: "A huge ox has stepped onto my tongue." When Agamemnon arrives in his chariot, he has on board the prophetess Cassandra as a slave and concubine. This, of course, serves to anger Clytemnestra further. The main action of the play is the agon, or struggle, between Clytemnestra and Agamemnon. She attempts to persuade Agamemnon to step on a purple (sometimes red) tapestry or carpet to walk into their home. The problem is that this would indicate hubris on Agamemnon's part, and he does not wish to do this. He would prefer it if he could return home without flourish, in the manner befitting a noble Greek warrior. Eventually, for reasons that are still heavily debated, Clytemnestra does convince Agamemnon to enter the house, where she kills him in the bath: she ensnares him in a robe and as he struggles to free himself she hacks him with three strokes of a pelekos, or ceremonial axe. Agamemnon is murdered in much the same way as an animal killed for sacrifice would have been, that is, with three blows. The last strike would have been accompanied by a prayer to a god. While Clytemnestra and Agamemnon are offstage, Cassandra discusses with the chorus whether or not she ought to enter the palace, knowing that she too will be murdered. Cassandra is a daughter of King Priam of Troy. Apollo has cursed her, giving her the gift of clairvoyance, but on the condition that no one would believe her prophecies. In Cassandra's speech, she runs through many gruesome images of the history of the House of Atreus, and eventually chooses to enter the house knowing that she cannot avoid her fate. The chorus, a group of Athenian elders, hears the death screams of Agamemnon, and frantically debate on a course of action. A platform is soon rolled out displaying the gruesome dead bodies of Agamemnon and Cassandra, and Clytemnestra, who attempts to explain her actions. Later, Aegisthus struts out and delivers an arrogant speech to the chorus, who nearly enter into a brawl with Aegisthus and his henchmen. However, Clytemnestra halts the dispute, saying, "There is pain enough already. Let us not be bloody now." The play closes with the chorus reminding the usurpers of Orestes, the son of Agamemnon, who will surely return to exact vengeance. The Libation Bearers (also known as Choephoroe) is the second play of the Oresteia. It deals with the reunion of Agamemnon's children, Electra and Orestes, and their revenge. 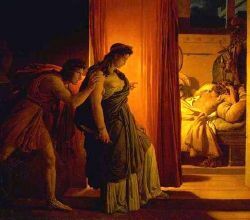 In the palace of Argos, Clytemnestra, who now shares her bed and the throne with her lover Aegisthus, is roused from slumber by a nightmare: she dreamt that she gave birth to a snake, and the snake now feeds from her bosom and draws blood instead of milk. 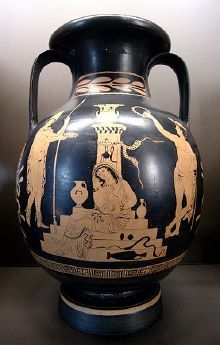 Alarmed by this possible sign of the gods' wrath, she orders her daughter, the princess Electra, who has been reduced to a virtual slave by Clytemnestra, to pour libations on Agamemnon's grave. A group of women (the libation bearers of the title) are to assist her. Electra arrives at the grave of her father and comes upon a man near the tombstone, who has just placed a lock of his hair on the stone. As they start to speak, it gradually and rather agonizingly becomes apparent to her that the man is her brother Orestes, who had been sent away to the royal court of Phocis since infancy for safety reasons. Together they plan to avenge their father's murder by killing their mother Clytemnestra and her new husband, Aegisthus. Orestes wavers about killing his own mother, but guided by Apollo and his close friend Pylades, the son of the king of Phocis, comes to accept that it is the correct course of action. Orestes and Pylades pretend to be ordinary travelers from Phocis, requesting hospitality at the palace. They even tell the queen that Orestes is dead. Delighted by the news, Clytemnestra sends a servant to summon Aegisthus. Orestes kills the usurper first, and then his mother. As soon as he exits the palace, the Furies appear and begin to torment him for his crime, causing him to flee in agony. The Eumenides (also known as The Furies) is the final play of the Oresteia trilogy. Orestes and the Furies go before a jury of Athenians, the Areiopagos, or, Rock of Ares, a flat rocky hill by the Athenian forum where the supreme criminal court of Athens held its sessions, to decide whether Orestes' murder of his mother, Clytemnestra, makes him liable for the torment they have inflicted upon him. Orestes is tormented by the Furies, underworld demigods that avenge patricide and matricide. He finds refuge and solace at the new temple of Apollo in Delphi. Unable to deliver him from the Furies' tormenting wrath, Apollo sends him along to Athens under the protection of Hermes, while he casts a spell upon the pursuing Furies, making them drowsy in order to delay them. Clytemnestra's ghost appears from the woods and rouses the sleeping Furies, urging them to continue hunting Orestes. The Furies' first appearance on stage is haunting: they hum a tune in unison as they wake up, and seek to find the scent of blood that will lead them to Orestes' tracks. Ancient tradition has it that on the play's premiere this struck so much fear and anguish in the audience, that a pregnant woman named Neaira miscarried on the spot. The Furies' pursuit of Orestes in Athens is equally haunting: Orestes has clasped Athena's small statue in supplication, and the Furies close in on him by smelling the blood of his slain mother in the air. Once they see him, they can also see rivulets of blood soaking the earth beneath his footsteps. As they surround him, Athena intervenes and brings in a jury of twelve Athenians to judge her supplicant. Apollo acts as attorney for Orestes, while the Furies act as spokespersons for the dead Clytemnestra. The trial results in a hung jury and Athena breaks the tie by voting in favor of Orestes, and then must persuade the Furies to accept her decision. They eventually submit. (In Euripides's version, Iphigeneia in Tauris, the Furies continue to haunt Orestes even after the trial.) Athena then renames them Eumenides (Ladies of Good Will). The Furies will now be honored by the citizens of Athens and ensure their prosperity. Athena also declares that henceforth hung juries should result in the defendant being acquitted, as mercy should always take precedence over ruthless justice. That the trilogy ends on a happy note may surprise modern readers more familiar with the tradition of tragedy from William Shakespeare, where bodies often litter the stage in the final act. In ancient Greek theater, tragedy did not necessarily end in death; many of the extant Greek tragedies, while filled with betrayal and murders, end happily. The Oresteia is best known for its allegorical content. Steeped in the mythological trappings of its era, the set of plays nevertheless catalogues the change from an archaic, tribal method of justice by personal revenge to the attribution of justice by trial, reflecting the transformation from a primitive society governed by a system of lex talionis to a more civilized society governed by a different value, justice, and a social institution, trial by a jury of peers. At the conclusion of the cycle of plays, the gods themselves sanction this transition by taking part in the judicial procedure, arguing and voting on an equal footing with the mortals. This theme of the polis—self-governed by consent through lawful institutions, as opposed to the tribalism that had predominated Athens before the founding of the republic—is a recurring one in Athenian art and thought. The dramatization of societal transformation in this myth (the transition to governance by laws) is both a boast and justification of the then relatively new judicial system. 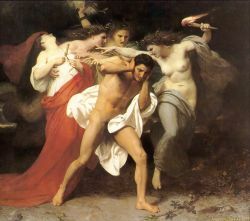 The concept of objective intervention by an impartial entity against which no vengeance could be taken (the state) marked the end of continuous cycles of bloodshed, a transition in Greek society reflected by the transition in their mythology—the Furies, who symbolized this sort of vengeful, violent justice, are a much greater part of older Greek myths than comparatively more recent ones. The Oresteia's mythic account of this transition in Greek society may be compared with the Bible's mythic account of the transition from human to animal sacrifice in ancient Israelite society in the story of Abraham's sacrifice of his son Isaac. The irony in these two stories is that it was Agamemnon's sacrifice of his daughter, Iphigenia, which became the motive for Clytemnestra's murder of Agamemnon and the destruction of the House of Atreus. In the Oresteia the resolution is a legal one, characterizing the Greek contribution to Western civilization. In the Hebrew story the resolution is religious, through God's redeeming expression of covenant-love, which can characterize the Hebrew contribution to Western civilization. The reflection of societal struggles and social norms in mythology makes the plays of Aeschylus of enduring interest, offering poignant cultural and historical insights to every generation. Buckham, Philip Wentworth. Theatre of the Greeks, 1827. Cicero. Tusculanae Quaestiones (Tusculan Disputations). Sourvinou-Inwood, Christiane. Tragedy and Athenian Religion. Oxford University Press, 2003. Wiles, David. The Masked Menander: Sign and Meaning in Greek and Roman Performance, 1991. This page was last modified on 3 February 2019, at 16:59.